Discussion in 'iPhone / iPad Apps' started by sk, Feb 5, 2012. 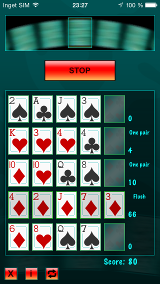 Easy to play poker solitaire game. 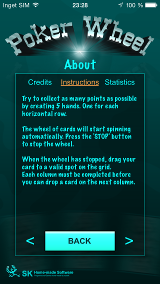 Try to collect as many points as possible by creating 5 poker hands. 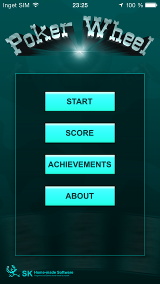 * Game Center integration and achievements. * Local leaderboard with details for your highest scoring games. * Statistics. Including details for your most recent played games. 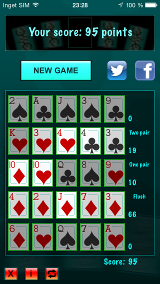 This is a slight variation, adapted for iPhone, of our previously released flash game. More info here. * Hi-res graphics and iPad support. * Details for your most recent played games. * You will be notified after a game if you've beaten your personal best or the global high-score. * Support for VoiceOver accessibility. All new but still the same. Rewritten from scratch for improved functionality and better support on all devices. Updated graphics and layouts to support new screen sizes and resolutions. Apple Watch App! Now you can play Poker Wheel on your Apple Watch. Layout fixes for iPhone X.